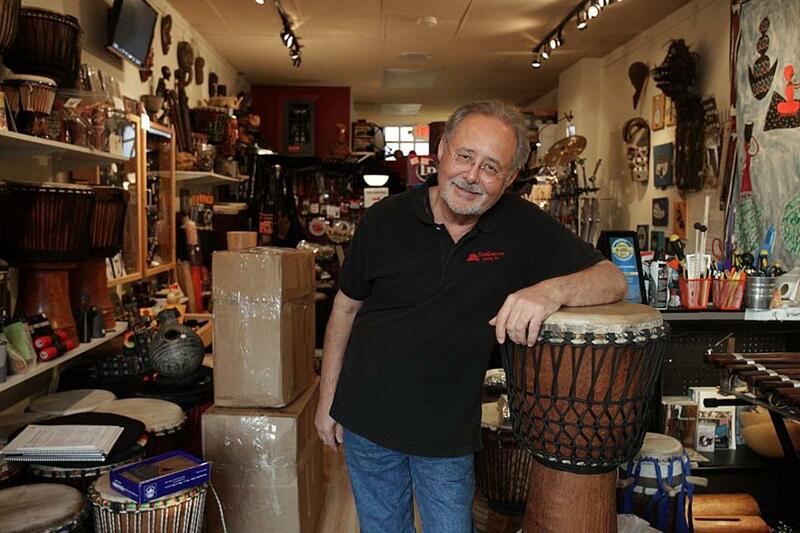 Alan Tauber, owner/founder of DrumConnection. Alan Tauber was 4 years old when a marching band parading past his Main Street home in Waltham inspired a lifelong love of drumming. He began giving lessons when he was still in high school and played in Boston bands until 1990, when he opened DrumConnection in Arlington. The community school and shop offers eclectic drums, full percussion repairs, traditional African drum classes for all ages and levels, drum circles, and a three-week cultural and musical immersion in Guinea to learn djembe and dunun drumming, Malinké music, and dancing. Q. Can anyone learn to drum? A.Absolutely. Even babies can play a few sounds on the drum. Q. How young can children begin lessons? A.Our classes start with 3- to 5-year-olds and involve lots of singing, traditional African game-playing, and drumming, which they love. Kids have a lot of energy and excitement, and they love to have fun, all of which is facilitated by our expert teachers. Q. Do some students, whether they’re kids or adults, simply have no rhythm? A. That’s a well-founded fear, but it’s not realistic. Out of the 100,000 people I’ve taught over the 25 to 30 years I’ve been doing this, maybe a few couldn’t learn because they had a social phobia or other issue that didn’t allow them to really ‘be’ there to learn. You need to be present to drum. Drumming is a powerful tool, an enriching and healing endeavor that can be part of a holistic approach to staying young and healthy. Q. What is it about drumming that is so special? A.If you drum for just five minutes, I defy you to tell me any problems you may have had when you came in. Playing music is one of the most demanding cognitive and neural challenges, requiring very accurate timing and multiple actions to produce authentic sound and rhythm. No other activity gives your brain the workout that drumming or playing another musical instrument does. Q. What happens on the annual trips you lead to Africa? A. It’s an intense experience. Drumming actually becomes secondary to experiencing the African villagers and their cultural society. I’ve been doing these trips for 15 years, and I can tell you, you cannot live the same life when you return. A part of you will always stay in Africa. DrumConnection is at 177 Mass Ave. in Arlington. Call 781-316-8068 or visit drumconnection.com.